If you are looking for sign installation costs in 2018, this post should help! The big cost of making and then installing a sign will depend on various factors. Firstly, indoor signs will often cost less than an outdoor sign because an indoor sign will not need to resist wind and weather elements that may destroy it. Lighted signs like billboards or neon signs will often cost more than a design that doesn’t use electricity. Lastly, temporary signs for events such as sales or promotions will cost less than a long-lasting design like those that have business names or those that are meant for the driving traffic. It is also worth considering the number of letters that are going to be on your sign and what materials will be used to make the item. Normal steel signs will cost between $25 to $35 per square foot while plastic or aluminum signs will cost between $15 to $25 per square foot. The least expensive signs will be made from urethane and will cost between $5 to $15 per square foot. A lighted sign could cost more then $35 per square foot while a neon sign will cost between $250 to $1250 per square foot. Having a storefront sign will give a great first impression of the store and will make sure that people see the business at night and during the day. There are many options when it comes to design, materials, and size. Because the sign will be the first thing that a customer sees, you need to pick a sign that will reflect your brand, services and products. This article will teach you about how to create your storefront sign that will give a big impression on potential customers. We will also cover how to pick a sign for your budget. One big aspect of your sign will be the logo, so keep in mind that a bad logo can ruin the impact of your sign. 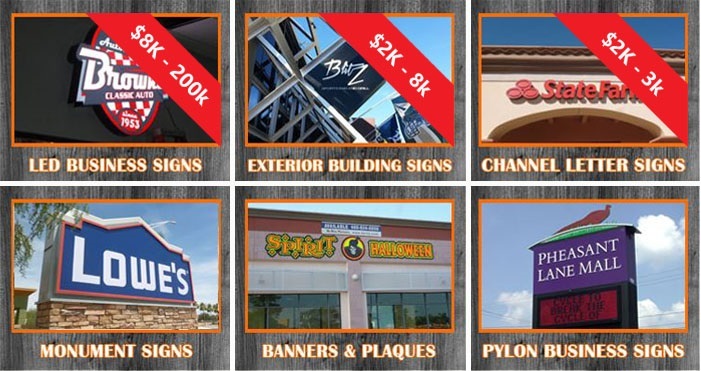 How Much Does Commercial Sign Installation Cost In 2018? Your storefront sign will be one of the first things that a potential customer will see when they visit your store, so it is vital to pick a sign that reflects your brand, and the types of services that you offer. Business signs may be made from different materials such as glass, metal, wood and fabric and each will have their own advantages and disadvantages. Fabric signs may be unique and colorful, but they do require a bit of upkeep and replacement when compared to other durable materials. Even though they are the budget choice, they can cost you more in the long run. Nylon, plastic or vinyl banners can cost between $4 to $10 per square foot. Installation averages around $180. You should also expect to pay for fade resistant, heavy duty fabric as well as for hardware. Fabric signs are great to get off the internet as a 4 foot by 6-foot sign is easily shipped. You will normally provide your logo and your finished sign will arrive in a few days. Fabric signs are very popular because of the versatility, so any type of business can use one. They can be simple such as a banner for a food kiosk or built into a framed light box for a larger retail store. The light box will make it easy for customers to read the sign at night. A plywood sign will be simple and affordable, but elegant. 4-foot by 4-foot painted plywood signs can start at $50 but that doesn’t include installation. Installation can be upwards of $192. The size of the type of paint and font or finish that you pick as well as how large the sign is will impact the cost. Other wood types like cherry or oak, but those will cost several hundred dollars for premium materials. These signs are also subjected to weather damage and may need to be frequently replaced. Painted plywood signs are great for restaurants who are looking to give their place an old-fashioned look. It can even work for upscale retailers who are looking to provide a rustic them or bespoke type of look. If you are looking for a low cost, but great looking option, you can use the store windows as canvas for your sign. Depending on the complexity and design, painted glass signs will cost about $175 if you are looking for some letters for a name on the door. However, you are able to get more detailed designs and high end all weather paints, but you will pay $1,000’s. A drawback is the lack of visibility from the street and the sun’s glare will lower the sign visibility. There are often painted glass on cafes or restaurants, so you may want to test this if you have a similar business. These signs are durable and weather resistant and they can offer you a modern and clean feel or even a historic flavor, based on the sign. A two-sided sign that is 18 inches by 24 inches can start at $80 without installation. The larger sized signs or adding texture and color can add the cost, but you will normally see costs between $250 to $2000. Based on the design, a punched metal sign can be used by any business that is looking for a modern, sleek sign or more of a retro display. These are 3-dimensional signs, and the shadows that they have will add interest and texture. Based on the size of the lettering and the metal that is used, these signs will start around $250, without installation or any custom design fees. It is recommended that you have them lighted to help attract more attention to the business, especially if you operate at night. You may pay between $350 to $550 more, but the customer visibility will grow. These signs are professional and eye catching and work well in various locations, but they are more expensive. The average 4 foot by 8-foot metal sign can cost around $350 or more without installation. Installation can be upwards of $450, depending on the size of the sign. Remember that for any material, the design will impact the sign price as a more complex sign will cost you more. For instance, if you use a metal sign board, with individually cut lettering, then you are going to may much more than if the lettering was painted onto the metal because there will be more custom labor that is involved. These signs weather quite well, but it is best to budget for some touch up work every few years. These signs give you the option of providing shade for your business, shelter for customers during bad weather, and attractive looks. The cost for an awning sign will be based on the fabric and size of the awning and the hardware that is needed to hang it. However, these signs will normally start at around $550 and increase in price. It has been stated that businesses that have awnings can see up to 30% energy savings. They are also built to handle bad weather, which makes them a great selection. Due to the design, you can have your business logo or name placed on the sides and front of the awning which increases the visibility for customers. The main thing here is to remember that the sign cost will be included in the installation charge, which will actually vary, but it could be up to $4,000 or more. Depending on the design, the awning sign may be used for cafes and restaurants to make the business feel nostalgic or for retailers who are wanting to have a unique storefront. Stone as well as other rock materials are great sign choices. They are able to deal with weather during long amounts of time. The signs are heavy, permanent and will provide a modern feel for businesses. A stone sign will start around $600 and go up to prices that exceed $11,000 depending on the material and size. Ask for stone alternatives in order to save a bit of money. Sometimes, you will be spending around $500 by using composite materials that are stone like. A disadvantage to a rock sign is that it is permanent, and it can cost a bit if you have to relocate if your business moves. Since a rock sign can take up a lot of space, they are best for big businesses that have some real estate to spare such as large retailers or hotels. These are also called LED or neon signs and the visual appeal for these signs are unlike any other. A custom neon sign can start at around $1100 and will increase based on the design complexity and the size, which can end up in the $11,000 range. The smaller “off the shelf” type of neon lights can be easily found. The overall upkeep can be expensive, so consider this before you purchase one. These lights are made from glass and may easily be damaged by bad weather and can cost a lot to repair them. Businesses that operate late at night, like clubs or bars will certainly benefit from having neon signs. Depending on the size of your monument sign, the average cost for installing one is around $2,300 to $8,000. This cost also depends of whether you choose to go with special features like brick or faux stone facing, arches, columns, etc. The cost to install a large pylon sign will start around $8,000 but can go all the way up to $200,000 depending on the height and whether you choose to go with an LED pylon sign. Channel letter signs will cost you anywhere from $2,000 to $3,000 depending on how many letters you choose, how difficult the fabrication is and the difficulty of where it is being installed at. All these factors will affect the pricing of the installation. Exterior signs building & commercial business signs come in many different styles and colors, and can also be custom designed to your specifications. Exterior sign prices can range from $200 to $1,500 depending on the design, fabrication and where it will be installed at. All these factors will affect the price of the installation. Lighted signs like Neon signs will cost more than signs that don’t use light. According to HomeAdvisor, commercial neon signs cost an average of $700 sq ft. Costs ranged from $200 to $1,200 in 2018. What Will Need To Be Included? A sign company that is full service will include a lot of services to a customer from designing the sign to manufacturing the sign, delivering it and installing the sign. Most companies will offer to come to the business location and survey the needs directly using a representative. Sign companies are also responsible for making sure that the designs are meeting the local ordinances, zoning codes and regulations. For instance, there are some cities that have banned billboards, and the American Disabilities Act has some strict rules about signs that have to be followed. The company is also responsible for the design process. Occasionally, the sign company will be in charge of the installation. This can be quite useful if the signs have to be placed in various places throughout an area or if the sign is quite large or it is supposed to be placed within an area that will be quite hard to reach. There are a lot of factors that will affect the costs for a sign, such as the number of colors in a design. Normally a black and white sign will cost much less than a colorful one. Also, if the design is complex, then it will be more expensive than a sign that only has a few words on it. Other facts that will need to be considered are the material that the sign is made from and what the sign will be used for. If a customer is doing a promotion, a less expensive plastic sign is a better solution. However, the business design should be made from a long-lasting material which will help to lower costs over time. It is also important that the size of the sign be considered. Normally, larger designs will cost much more than a smaller sign. Lastly, the installation may also affect the cost of the sign. Installing a neon sign or billboard will be much more expensive than installing a sign in front of a business. Deciding based on these factors can help to control the costs of the sign. Picking a sign company that is right for you will often be selected based on the services, sign type that a customer wants, and the cost. For a long-lasting sign, it is important that you pick a company that will have the materials that you want to purchase. It is also vital to consider the designing options that the company offers. There are several factors that will include whether the company that is picked can produce the sign with the needed size, if they can install the sign, and if they offer illumination if the customer is looking for that. Signs are a great way to market and are normally quickly read, so it is important that the company has great design options and can produce a great sign that can be used to capture the attention of the customer. You can save money on a sign by purchasing a stock design instead of a custom design. While many signs are often custom made, the pre-made standard signs are a great way to save money. Stock signs are normally available for warehouses, laboratories, and retail stores. Another way that you can save money is to order several of the same sign. Normally, the prices will decrease per design as the number of signs that are ordered go up. If a business knows that they will need to have multiple copies for the future, then it is best to consider purchasing copies at the same time to save money. Additionally, those who believe the signs could change over time need to consider getting a design that can be easy to update and may be done by the staff or business instead of the designer at a sign company to help reduce costs. A really great tip is actually to place an order for your designs during off seasons such as the winter as the companies are often busiest during the summer time. So, if you happen to order during winter can result in discounts or promotions for your orders as well as a short wait time. Arizona Commercial Signs offer sign installation services throughout the entire Phoenix Metropolitan area in Arizona. Get a free sign installation estimate by contacting us today! We offer installation of many different signage types including: Interior Office Signs, Exterior Building Signs, monument signs, pylon signs, LED signs, neon signs, pole signs, multi-location signage and more. Call Arizona Commercial Signs today at 480-921-9900 for your free sign quote.